Wyrd (or sometimes Weird) is a term for concepts roughly corresponding to those of fate or destiny but involving complex interactions of universal necessity and individual choice within a cosmos beyond any fixed notions or concepts of mortal minds. The word is ancestral to Modern English weird, which retains its original meaning only in dialects. The Old English term wyrd derives from a Common Germanic term *wurđíz. Wyrd has cognates in Old Saxon wurd, Old High German wurt, Old Norse urðr, Dutch worden (to become) and German werden. The Proto-Indo-European root is *wert- "to turn, rotate", in Common Germanic *wirþ- with a meaning "to come to pass, to become, to be due" (also in weorþ, the notion of "worth" both in the sense of "price, value, amount due" and "honour, dignity, due esteem"). Old English wyrd is a verbal noun formed from the verb weorþan, meaning "to come to pass, to become". From the 14th century, to weird was also used as a verb in Scots, in the sense of "to preordain by decree of fate". The modern spelling weird first appears in Scottish and Northern English dialects in the 16th century and is taken up in standard literary English from the 17th century. The now most common meaning of weird, "odd, strange", is first attested in 1815, originally with a connotation of the supernatural or portentous but by the early 20th century increasingly applied to everyday situations. In modern paganism and mysticism use of the words "weird" and "wyrd" have been revived with more of their original connotations and meanings. Balder holds up a completely blank rune. Wyrd. The beginning and the end. Fate. Wyrd's shaping changes the world under the heavens. Fate goes ever as she shall! The most fundamental concept in heathenry is wyrd. It is also one of the most difficult to explain and hence one of the most often misunderstood. … The Anglo-Saxon noun wyrd is derived from a verb, weorþan, "to become", which, in turn, is derived from an IndoEuropean root *uert- meaning "to turn". (If you noticed the redundant use of "turn" in the previous sentence, good. The use of the modern English phrase "in turn", illustrates wyrd in action. Watch for it throughout this article.) Wyrd literally means "that which has turned" or "that which has become." It carries the idea of "turned into" in both the sense of becoming something new and the sense of turning back to an original starting point. In metaphysical terms, wyrd embodies the concept that everything is turning into something else while both being drawn in toward and moving out from its own origins. Thus, we can think of wyrd as a process that continually works the patterns of the past into the patterns of the present. Wyrd is the unfolding of our personal destiny. It has sometimes been translated into modern English as "fate." But it is much deeper than that. It does not see our lives as "pre-determined." Rather, it is an all-encompassing view which connects us to all things, thoughts, emotions, events in the cosmos as if through the threads of an enormous, invisible but dynamic web. Today, scientists know intellectually that all things are interconnected. But the power of Wyrd is to realise this in our inner being, and to know how to use it to manifest our personal destiny. Today, through a deep connection with wyrd, we are inspired to see our lives in a new and empowering way. It restores our experience of the healing power of love, nature and creativity. It is about letting into our lives the guidance of an extended universe of spirit. It brings ancient wisdom together with modern science in the service of enhancing our lives, and the integrity of our human presence on the planet. Brian Bates, in Way of Wyrd, Introduction : What is "Wyrd"? Wyrd existed before the Gods and will exist after them. Yet wyrd lasts only for an instant, because it is the constant creation of the forces. Wyrd is itself, constant change, like the seasons, yet because it is created at every instant it is unchanging, like the still center of a whirlpool. The pattern of wyrd is like the grain in wood, or the flow of a stream, it is never repeated in exactly the same way. But the threads of wyrd pass through all things and we can open ourselves to its pattern by observing the ripples as it passes by. The threads of wyrd are a dimension of ourselves that we cannot grasp with words. We spin webs of words, yet wyrd slips through like the wind. The secrets of wyrd do not lie in our word-hoards, but are locked in the soul. We can only discern the shadows of reality with our words, whereas our souls are capable of encountering the realities of wyrd directly. This is why wyrd is accessible to the sorcerer: the sorcerer sees with his soul, not with eyes blinkered by the shape of words. Do not live your life searching around for answers in your word-hoard. You will find only words to rationalize your experience. Allow yourself to open to wyrd and it will cleanse, renew, change, and develop your casket of reason. Your word-hoard should serve your experience, not the reverse. All our lives are locked together in the shimmering world of wyrd in which all things are enmeshed and connected to one another by the threads of wyrd. ….The wyrd sisters spin the web of wyrd and weave the loom of life, they do not thereby determine it … the wyrd sisters simply express the will of wyrd. And so do we. We cannot control our lives, because we too are inseparable aspects of wyrd and express its will. But this is not the same as saying our life is determined. Rather, it is saying we live like an ocean voyager, trimming our sails to the winds and tides of wyrd as we skim across the waters of life. And cresting the waves of wyrd is something that happens at every instant. The pattern of life is not woven ahead of time, like cloth to be worn later as a tunic. Rather, life is woven at the very instant you live it. I don't know what that means, but it's not doing anything to uncreep me. In Anglo-Saxon literature, which Tolkien knew, the place of fate (wyrd) is central. Only occasionally is it suggested that efforts of the hero are determinative. 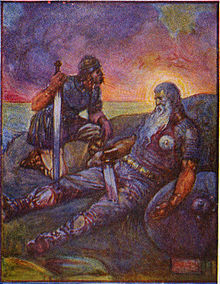 Beowulf, most famously, gives himself up to the powers of wyrd before each battle, accepting as fact that the outcome has already been determined. The task of the hero, therefore, was to fight well, to earn a reputation as a great warrior.